“The Monastery of St. Elian was a Christian monastery near the town of Al-Qaryatayn in the Homs Governorate,” says Wikipedia. “Was”? Yes, the tense is accurate. It had stood there since the fifth century as a place of worship and spiritual inspiration, faithfully curating the bones of Mar Elian el-Sheikh – St Julian the Old – a Christian martyr from Emesa (modern Homs) who was murdered by his own father for refusing to renounce his Christian faith. 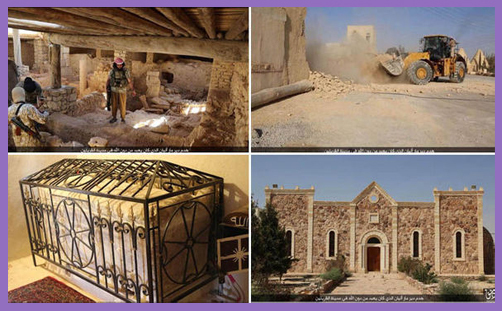 The monastery is no more: “It was destroyed on 21 August 2015 by the Islamic State of Iraq and the Levant in the Syrian Civil War,” we read. It had long been a place of interfaith dialogue between Christians and Muslims. A 15th-century inscription just inside the entrance to the shrine read: “This is a holy place and everybody here is protected.” No more, of course. The entrance is now a pile of rubble, and any protection for Muslims or Christians who revered St Elian (or Sheikh Ahmed, as local Muslims called him) has also gone – dust to dust. But it isn’t only the bricks and mortar – ancient, blessed and venerated as they were. ISIS / Islamic State / Daesh militia have kidnapped two priests: Fr Jacques Mourad, who was abducted in May 2015, and Fr Paolo Dall’Oglio has been missing since 2013. Funny how we hear more about the stones of the temple than the temples of the Holy Spirit. Amidst the violence, brutality and annihilation of the apocalypse are the ravings of hordes of brown-eyed devils. They drive JCBs, cleansing the land of idolatry, and they carry swords, dripping with the blood of martyrs. They have not come for interfaith dialogue, but to judge the wicked. There is no pardon for those who are not chosen: just perpetual revenge and unbearable suffering in the murderous consummation decreed by Mohammed – so they say. When the Disciples sat on the Mount of Olives and asked about the signs of his Second Coming and the end of the world, Jesus talked of wars and rumours of wars; of nation rising against nation and kingdom against kingdom; of famines, pestilences, earthquakes, deceivers, false prophets, betrayals, hate and iniquity. But know this, that in the last days perilous times will come: For men will be lovers of themselves, lovers of money, boasters, proud, blasphemers, disobedient to parents, unthankful, unholy, unloving, unforgiving, slanderers, without self-control, brutal, despisers of good, traitors, headstrong, haughty, lovers of pleasure rather than lovers of God, having a form of godliness but denying its power (2Tim 3:1-5). Having a form of godliness but denying its power? Denying justice? Denying mercy? Denying peace? Denying love? We don’t have to look very far for that, do we?